When writing classes move from the physical classroom to an online environment, instruction happens principally through textual communication—meaning that students and teachers alike are writing and reading more than ever before. Reading to Learn and Writing to Teach: Literacy Strategies for Online Writing Instruction is informed by the premise that the increased literacy load of an online environment is the most critical difference between online and onsite instruction, and thus warrants strengthening students’ reading skills and adjusting teachers’ writing skills to improve communication and learning. 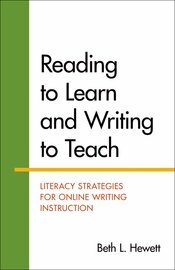 To help accomplish these goals, Reading to Learn and Writing to Teach offers explicit reading strategies for students accompanied by correlated writing exercises, as well as guidelines and strategies that aid instructors in communicating clearly and teaching effectively.